It all started when a co-worker of mine, Jeff, came by to visit me from New York to stay over for the weekend. Maybe it started before then because I went to visit him first. Either way it’s all Jeff’s fault:) I had always wanted to do a home studio project but what was stopping me was doing the electrical work. We had so much fun when I went out to visit him at his home. We stopped in to take in the sights and sounds of Niagara Falls, cleaned out his huge garage and took a fun and leisurely canoe trip down the river. He reciprocated by stopping by and putting me to work. Go figure hey? Actually, he motivating me to get started on my home studio project that had sat for years left quite undone. So, for that Jeff, there’s only one word for that – Whitewater!!! Thanks a million! It was one of those projects where it would cost a lot of money if hired it out professionally and that was never really something I wanted to do. I usually do things myself but for this project I never got around to doing it. I had visions of a very nice and cozy room and one that satisfied my need to be able to make music. Additionally, after spending nearly 10 years writing music in a cold dark corner of my basement it seemed about time to put something together much more suited to my taste and a whole lot more comfortable. Jeff came by on a Friday night and we had a wonderful time chatting, playing pool and enjoying our favorite beverages. He somehow managed to get me to talk about what I wanted to do in my “old” studio to make it nicer. I had explained to him that first I needed to have some more electrical outlets for my equipment and that started the ball rolling. All I could think about was how risky it was to do electrical work. Electrical shocks, OUCH! 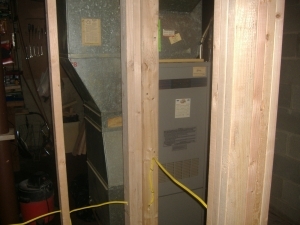 Note: Some general information regarding the electrical aspects of this project will be written about in this post while other topics such as the wood I used, problems I faced and the finished project will be discussed in subsequent posts. 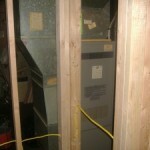 This first photo is an example of the electrical work we did over the next couple of days. Most of the work was done on Saturday and we simply enjoyed our visiting on Sunday looking for Illinois license plates. 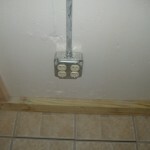 Our “work” that weekend involved putting in some more electrical outlets as shown in the photo below. There are four now where there was none before. We also put in four others in another location (a different wall) nearby and an additional two on the same wall shown in the photo but about eight feet away. The 2 x 4’s showing in the picture were the beginnings of the new interior framing that was going in. All in all we managed to install 10 new electrical outlets expanding my world a lot. 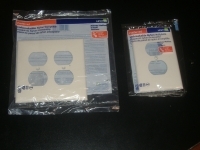 After Jeff had left to return back to New York I changed the electrical outlet box covers to be the unbreakable ivory colored, nylon type of covers you may be more familiar with. 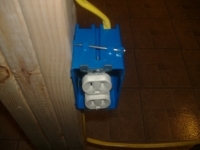 Also, as the project progressed and the building codes were understood more I changed to using the outlet boxes shown in the following photo. They were easier to work with but I think the metal ones are better over time. Personal choice of color I think was the reason I choose to use the blue plastic ones. They come with a long mounting nail on the top as seen in this picture. There is another nail on the bottom too so it is securely mounted once installed. You just simply locate where you want to place it and nail it down. One thing to remember is that you need to know how thick your outer wall covering is to determine the best depth location of the box, otherwise, you will have to pull them and relocate them later once the thickness is known. So it is best to know the thickness of the out wall cover such as 1/2″. 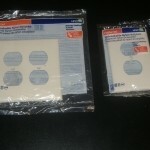 5/8″ 3/4″ for drywall or 3/4″ thick for the wood I used. There are markings on the side of the box to help you with the depth placement. In case you do not know, the yellow wire is called Romex and it is basically a black plastic coated wire, a white plastic coated wire and a bare copper wire wrapped in paper with a plastic sheath on the outside of all three wires. 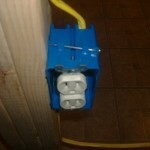 Also, the black wire is the live or powered wire, the white is the neutral wire and the bare one is your ground wire. I was getting excited thinking maybe my home studio could actually get done. I was doing pretty good until I discovered that trying to bend wood around a corner was not all that easy:) Further, how do you keep the wire inside the inner portion of the 2 x 4’s and turn the corner inside the body of the wood? Now I am not a very good carpenter but I had to figure out how to drill two holes that intersected through two 2 x 4’s on one side and three 2 x 4’s on the other. Only one wire goes through all of the holes in both sections (note the right collection of joined 2 x 4’s). 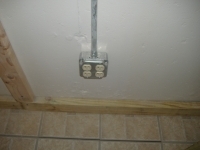 Plus, I had to drop the height of the wire several inches for the second wall to properly place the outlet on that wall. Geometry and me didn’t get along so well but somehow I managed to pull it off. Hope that makes sense to you. The above photo shows my handy work and my level of understanding about interior wall construction, limited as it is. 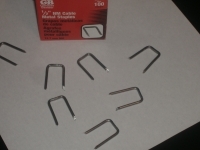 Oh yeah, to hold the wire onto the 2 x 4’s I used 1/2″ NM Cable Metal Staples. They came in a box of 100 and I didn’t think I would use them all too often but certainly what did I know? I put in a total of about 250 feet of Romex wiring into this project. I’ve got about two dozen of the staples left over. I managed to destroy about 6 during the hammering process. The total truth is that after Jeff and I did all of the electrical work I hired an electrical contractor to come in to inspect it to see if our work met the city building codes and to hook it all up in the junction box. He did have to make a few changes necessary to meet them but for the most part a lot of the work was correct. He spent three hours completing the work and he even found some time to tell me a couple of good jokes:) I was glad to learn that I had saved about 2 hours at his labor rate by doing all of the “prep” work and so I took that money and purchased more wood with the extra cash. Spending the money for the professional electrical services was pretty cheap insurance and for a novice like me, it enabled me to sleep soundly at night without concerns of an electrical fire or something nasty happening. Running out into the street at 3 in the morning half naked is not my idea of fun. I’ll be talking more about the wood I used in the next post. Until next time, I hope if you take on a project like my home studio project that you take the time to think things through or hire someone to do the work for you. There are many challenges to face on the fly when doing things like this and spending just a little bit of time to get your head around a project comes in handy especially the electrical part and the city building codes.